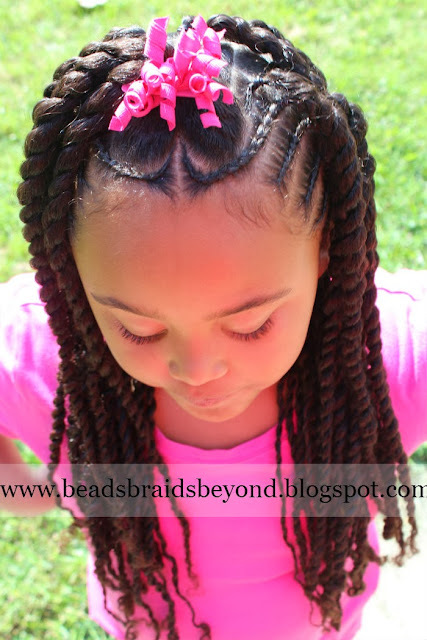 Beads, Braids and Beyond: Cornrows, Twists & Hearts... Oh My! Cornrows, Twists & Hearts... Oh My! Quite the combination, eh? See, what had happened was... 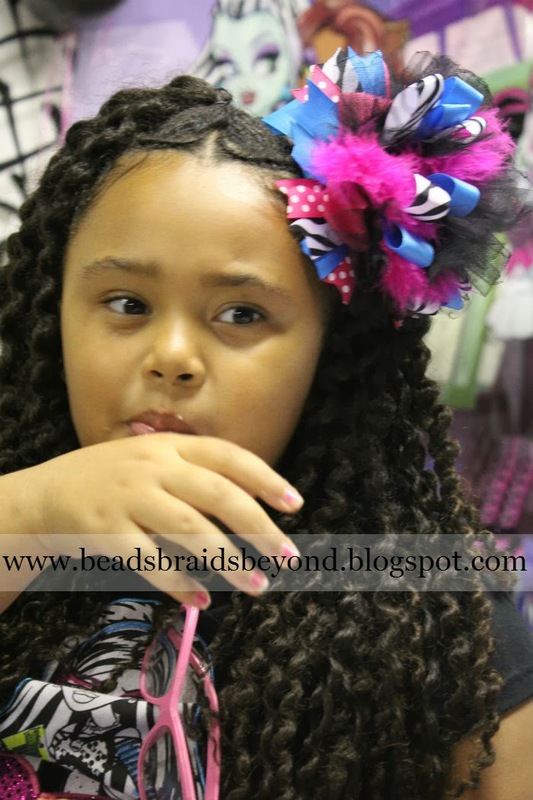 I began styling Miss A's hair with absolutely no plan in mind. I think the outcome was cute and age appropriate for young girls, wouldn't you say? Never mind that. I'm pretty sure you're all wondering where we've been... yes? Well, let's just say life happened. Between Lil Man being diagnosed with autism, Miss A being diagnosed with epilepsy, becoming a full time working single mom and almost everything you can think of in-between, it's safe to safe my hands have been full... and not with my daughters hair, as you can imagine! Ha. If you're interested in reading more about our personal life, feel free to stop by my other blogs Facebook page, Nik Gets Fit, chronicling my life and weight loss journey. I washed, banded and moisturized Miss A's hair as usual. If you've been following us for a while then you have probably already checked out her hair care routine, if not, click here for all the details including the products I use for this process. Once her hair was banded, I parted the top section of hair from ear to ear and tied off the back. I began parting near her right ear first to begin the first cornrow. New to cornrowing? No worries! 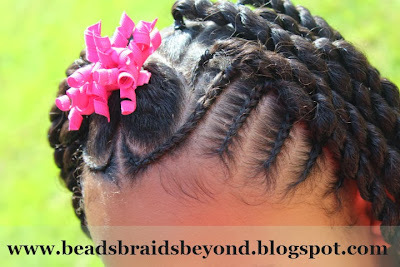 Check out our Cornrowing for Beginners post, here. 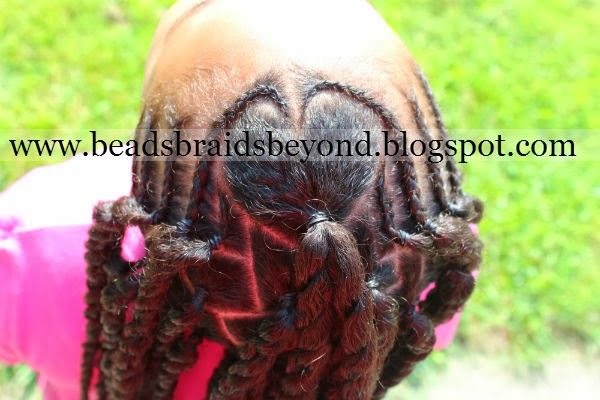 Once I had a few cornrows on each side, I decided to part a heart right on top. I'm not sure why, it just seemed like a good idea at the time. As you can see, my parting skills are a little rusty, I haven't done a heart in quite some time. As for how I parted the heart, well, it's actually very simple. Take your metal rat tail comb, and "draw" a heart in your child's hair. You may have to do this a few times. Always perfect your "rough draft" if possible! Once you have a shape that somewhat resembles a heart (haha), place that section of hair in a ponytail. Alright, so now we have the cornrows, we have the heart... now all that's missing are the twists! I wanted larger twists so I twisted the remaining hair from two cornrows together at a time. 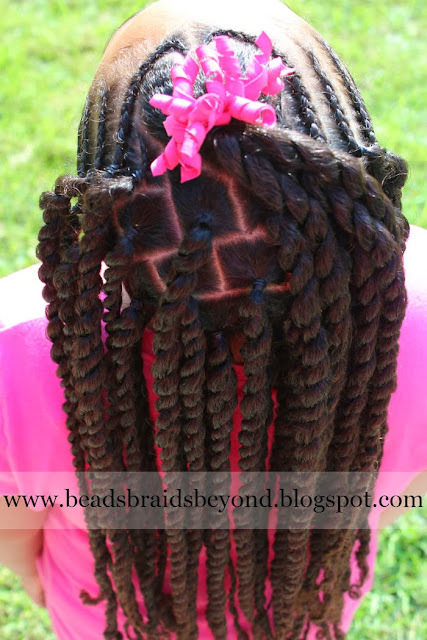 I parted squares with the remaining hair in the back, placed a rubberband at each base, and twisted. 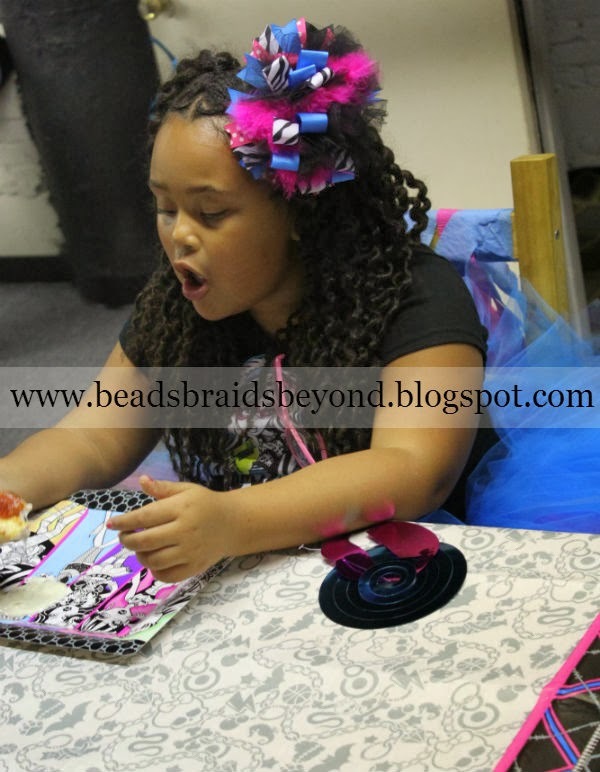 After about 1 week of wearing this hair style, I removed the two strand twists, creating a gorgeous twist out for Miss A's birthday party! Check out the pictures below. Shout out to Miss Teeny Fab Couture for making Miss A's custom Monster High birthday party outfit! Stay tuned for another hair style this week! Yes, we're baaaaack!